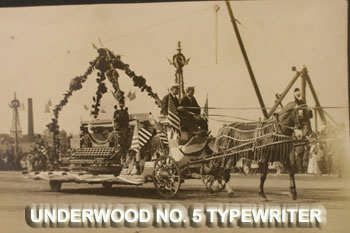 First in line for the industrial parade were the Underwood typewriter floats, probably because the company’s President, Charles D. Rice, was Chairman of the Industrial Committee. One of these floats was a huge replica of the Underwood No. 5 Typewriter, which was 210 times larger than the original. It was “perfect in every detail” and was mounted on a rotating base so that the crowd could view every angle of the model. Fifteen hundred Underwood employees marched behind wearing white caps and carrying a banner with the monogram “UT”. One thousand workers from the Cheney Brothers’ silk manufactory in Manchester marched behind their company’s silk, velvet, and brocade covered float. 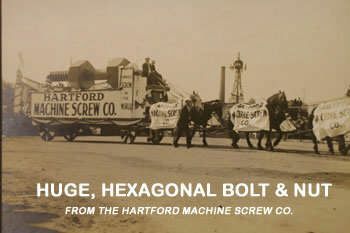 The Hartford Machine Screw Co. float carried a giant hexagonal bolt and nut which was painted to imitate metal. The head of the bolt was four feet across. The Courant reported that it would have weighed 18 tons if the bolt and nut had been made of metal. Three hundred men marched for this company. The Henry & Wright Manufacturing Company’s float exhibited several examples of their single- and multiple- spindle ball-bearing drilling machines. The float from Colt’s Patent Fire Arms Manufacturing Company was described by The Courant as a “small arsenal.” Featured prominently on the float was the large wooden Model 1873 Single Action Army, the gun that supposedly “Won the West.” It had been removed from above the entrance to the company’s office just for this special occasion. 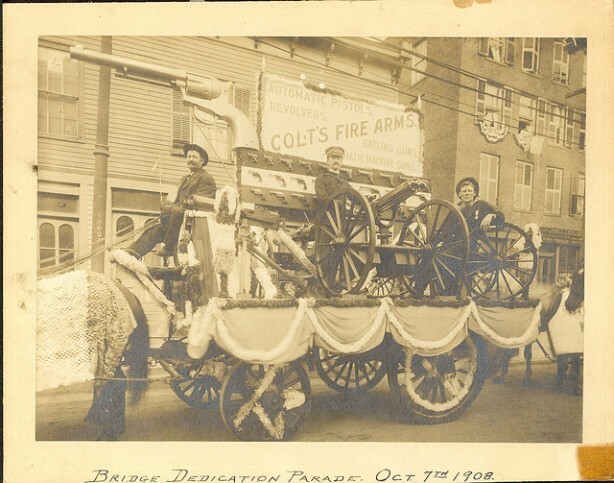 The float also included examples of the company’s revolver production and examples of the Maxim guns, Gatling guns, and Colt Automatic guns. The Courant described the attire of many of the contingents of working men and reported that each group was roundly applauded by the crowd as they marched past, over the bridge and into East Hartford. These surviving photographs of the Industrial Day parade capture the civic pride in the accomplishments of a thriving city poised at the beginning of a new and promising century. Dave Corrigan is Curator for the Museum of Connecticut History. © Connecticut State Library. All rights reserved. This article is excerpted and originally appeared in The Connector Vol. 10/ No. 4, OCTOBER 2008.